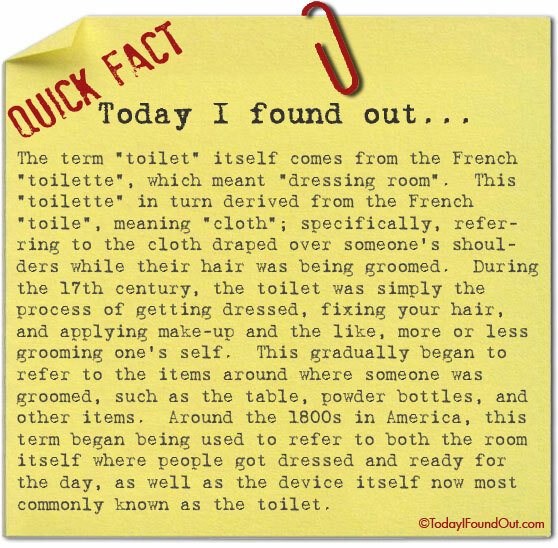 The term “toilet” itself comes from the French “toilette”, which meant “dressing room”. This “toilette” in turn derived from the French “toile”, meaning “cloth”; specifically, referring to the cloth draped over someone’s shoulders while their hair was being groomed. During the 17th century, the toilet was simply the process of getting dressed, fixing your hair, and applying make-up and the like, more or less grooming one’s self. This gradually began to refer to the items around where someone was groomed, such as the table, powder bottles, and other items. Around the 1800s in America, this term began being used to refer to both the room itself where people got dressed and ready for the day, as well as the device itself now most commonly known as the toilet. Origin of toilet may have been for cleaning oneself to be made presentable to the public. Indeed chamber pots were difficult, outdoor toilets smelly and often times ill equipped. However, as the word toilet is used today in the marketing of water systems of plumbing whether by patent design or not was an early MARKETING TOOL. The word toilet implies cleaning of oneself what better marketing connection than this. However, in today’s world where the majority of people have no access to sanitary human waste disposal the use of the word toilet was an UTTER MARKETING FAILURE. The reason is its dependence on WATER for SANITARY disposal of human waste. Fresh water is needed for human consumption not human waste! Problems of sanitation has yet to be resolved. Happy toilet day November 19.